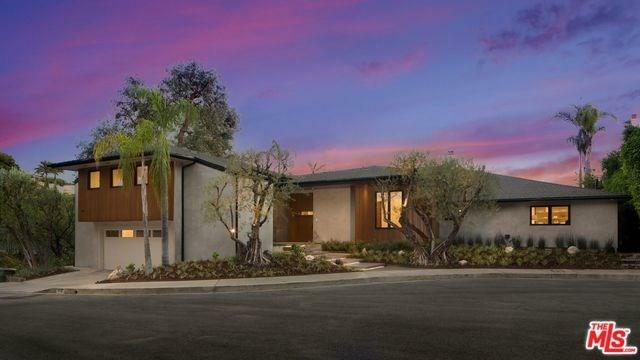 A sophisticated and very private entertainer's home, this Beverly Hills contemporary is newly remodeled with high ceilings, wonderful flow, exquisite canyon and ocean views, and is located on a quiet cul-de-sac. A lighted, floating-slab stairway leads to an oversized oak front door, which pivots to reveal spectacular living/dining/family room with disappearing walls of glass that open seamlessly to the pool and views. The adjacent kitchen, with Italian-designed cabinets and Miele appliances, offers a breakfast area plus counter seating at a large marble island. The master bedroom and spa-like master bath open onto the pool deck, where there are spacious covered and open areas for lounging, dining, and entertaining. There are three additional family bedrooms plus a large bonus room above the garage. 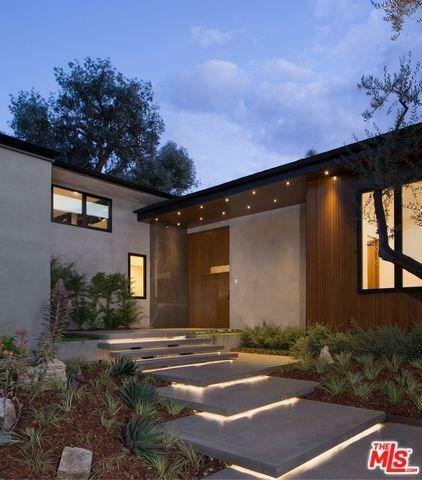 Contemporary styling with Fleetwood doors and windows, smart-home systems, and abundant natural stone and wood. Reimagined with exceptional taste and style for elegant indoor-outdoor living.